Dentistry is about the health whole mouth. All of the soft tissues and bone matter around the teeth are just as important to clean and care for, and just as susceptible to inflammation and decay if left untreated. Gum disease doesn’t only cause pain and discomfort. It also threatens the safety of the teeth. There are two major stages to gum disease: Gingivitis, and Periodontitis. Both of them start the same way. A film of bacteria called plaque grows on everyone’s teeth. It is impossible to stop, but it is possible to clean. Normally, when plaque builds up on our teeth, we scrub it off with a good brushing and flossing. Daily oral hygiene is essential in keeping this biofilm at bay. If left to its own devices, however, plaque hardens into a tough, mineralized substance called tartar. Tartar cannot be removed without professional cleaning. This harder material irritates the gum tissue around it, making it slightly sore, sensitive to temperature changes, and susceptible to bleeding. This is the first stage of gum disease, known as gingivitis. Gingivitis often doesn’t seem like much of a problem. The sensitivity isn’t all that bad, and the teeth around it are fine. But this is just the first step to something much more dramatic. Hardened tartar inconveniently makes the perfect surface for even more plaque to build and grow. More plaque equals more tartar, more tartar equals more irritation, and if left untreated, more irritation can lead directly to bone loss, tissue recession, and loosened teeth. This is Periodontitis. Periodontitis can be a scary experience. No one wants loose teeth as an adult, let alone the pain and swollen tissue that comes with it. But there’s good news: gum disease is treatable. 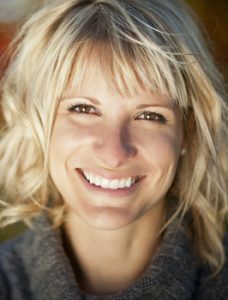 Perkins Dental will clean your teeth and gums with a technique called periodontal scaling and root cleaning. That’s a lot of words to describe a pretty simple process. We use some specially designed tools to eliminate all tartar from your mouth. It’s as simple as that. Once the tartar is gone, and any remaining pockets of bacterial plaque are cleaned away, the gums and bone around the infected area will have a chance to heal. If your gums are sore and sensitive—or worse—please don’t wait to call us. Perkins Dental will clean your entire mouth, so that you leave our office with your teeth feeling fresh and completely safe.